Before I show you what the Lord showed me about our armor, I have a message for some of you : You have been anointed, now act like it…if this speaks to you, here is more: The enemy is after you and has laid out many traps ahead. Stay focused on the Lord and cling to Him, do not depart. So I kind of disregarded the shoes, I figured, I’m not on a mountain, and I’m not a missionary – so maybe it’s not for me…. until one day in church, the Holy Spirit spoke to me. I was standing next to someone who really annoyed me. I remember standing there mad as those around me sang their praise, I stood and told the Lord how annoyed I was (and it was because I wasn’t getting my own way). I immediately heard “put on your shoes of peace”. I knew instantly that I was to make peace, control myself, change my attitude and be quiet. I just knew, however, I really didn’t want to do that, I would have much rather done something else. I obeyed, and I regret that I didn’t obey with a good attitude. The Lord supernaturally blessed me that day with many blessings as I walked in obedience. I understood that the shoes of peace are so much more than we can imagine. “How beautiful on the mountains are the feet of the messenger who brings good news, the good news of peace and salvation, the news that the God of Israel reigns” Maybe I now understand that my life is my testimony and the way I behave sends out a message of the good news of Jesus Christ, my Lord and Savior. I am so excited about this new key to protection I have discovered as I studied our armor and warfare… it seems so simple, yet it is so powerful. And this is what I have discovered: Peace is a protector, Peace protects us, (and this peace if from the Lord) it closes a door to the enemy. There is a supernatural link and key between peace and righteousness (right living) that protects those who fear the Lord. If you want protection from your enemy and his traps, you must live your life in obedience. Always searching and working hard to maintain a peaceful life in all circumstances and living a life of righteousness and right living. 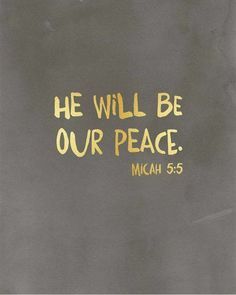 This peace is a gift and a blessing given to you from the Lord God and His Son Jesus. Do you see the connection between peace and right living –and it’s all intertwined like a puzzle as we study our armor. Peace (shoes) and Righteousness (breastplate) need to be worn at all times, we can’t have one without the other. Notice the righteousness in the verse above goes before him AND SHALL SET US IN THE WAY OF HIS STEPS. Righteousness and peace protect us, keep us on God’s path and set us in the way of His steps. Okay, can you tell I’m so excited about this! For right now, I want to dive deeper into peace and then righteousness another time because there is much to learn about this peace- our shoes we put on with the preparation of the gospel of peace. What happens when we listen to His commands? We will have peace and righteousness! Isaiah 48:18Oh, that you had listened to my commands! Then you would have had peace flowing like a gentle river and righteousness rolling over you like waves in the sea. What does righteousness bring? Isaiah 32:17And this righteousness will bring peace. Yes, it will bring quietness and confidence forever. Am I making sense? You see, if we live right, obey God and work hard for peace- this gives us protection. Think about it this way. Imagine you are really upset or angry with someone. If you obey God’s word and work at peace and forgive as the Lord has told us to, the enemy has no open door to come in and bother you. However, if you lose control and say things you don’t want to – watch out because sin is waiting at the door for an opportunity to take over and master you. Obedience pays off, the Lord’s words don’t fail, surely we reap what we sow. Peace is a blessing from the Lord.The Lord watches over all who do right and he hears their cries Psalm 29:11The LORD gives his people strength. The LORD blesses them with peace. Come, my children, and listen to me, and I will teach you to fear the Lord. Does anyone want to live a life that is long and prosperous? Then keep your tongue from speaking evil and your lips from telling lies! Peace takes effort on your part- you have to search for it and maintain it . Turn away from evil and do good. Search for peace, and work to maintain it. The eyes of the Lord watch over those who do right; his ears are open to their cries for help. But the Lord turns his face against those who do evil; he will erase their memory from the earth. The Lord hears his people when they call to him for help. He rescues them from all their troubles. The Lord is close to the brokenhearted; he rescues those whose spirits are crushed. The righteous person faces many troubles, but the Lord comes to the rescue each time. For the Lord protects the bones of the righteous; not one of them is broken! Calamity will surely overtake the wicked, and those who hate the righteous will be punished.22 But the Lord will redeem those who serve him. No one who takes refuge in him will be condemned. Peace brings health: Proverbs 14:30A peaceful heart leads to a healthy body; jealousy is like cancer in the bones. You can have peace with your enemies when you live your life to please the Lord:Proverbs 16:7When people’s lives please the LORD, even their enemies are at peace with them. The Lord’s teaching brings Peace upon our childrenIsaiah 54:13I will teach all your children, and they will enjoy great peace. Jesus has left us with this gift:John 14:27“I am leaving you with a gift—peace of mind and heart. And the peace I give is a gift the world cannot give. So don’t be troubled or afraid. Peace protects our mind and heart and keeps us from being troubled or afraid. Peace with the Fear of the Lord is a powerful combinationActs 9:31 The church then had peace throughout Judea, Galilee, and Samaria, and it became stronger as the believers lived in the fear of the Lord. And with the encouragement of the Holy Spirit, it also grew in numbers. We are to live a life of peace and Joy in the Holy spirit Romans 14:17 For the Kingdom of God is not a matter of what we eat or drink, but of living a life of goodness and peace and joy in the Holy Spirit. Gal 5:22 But the Holy Spirit produces this kind of fruit in our lives: love, joy, peace, patience, kindness, goodness, faithfulness, 23 gentleness, and self-control. There is no law against these things! Discipline results in a peaceful harvest of right living Hebrews 12:11 No discipline is enjoyable while it is happening—it’s painful! But afterward there will be a peaceful harvest of right living for those who are trained in this way. Peacemakers reap a harvest of righteousness!James 3:18And the fruit of righteousness is sown in peace of them that make peace. Shoes protect us and so does peace. When I don’t wear shoes and walk outside I’m always concerned about what I might step on-broken glass, hot asphalt, thorns, red ants, wasp stingers,etc… but if I wear my shoes I don’t have to worry about anything I might step on. I can walk on burning sidewalks, over broken glass and nothing will hurt me. So it is with the sh0es of peace- you can walk through stormy waters and burning coals, but nothing can touch you- because you are covered and protected by the Peace of the Lord Jesus. Peace protects us, fills us with joy, keeps us healthy, guarantees us a wonderful future, keeps us from stumbling, brings blessings, protects our mind and heart and keeps us from being troubled or afraid, brings righteousness, fills your heart with joy. Peace is attained through the Lord by our obedience, our searching for it, Peace is given to those who love the Lord’s instructions and Fear Him. So here’s the final question: What part of your life do you need to work on in order for God’s peace to reign? How can you be a peacemaker and please the Lord your God and Maker? Turn away from it and pass on Keep your heart with all diligence,For out of it spring the issues of life. Do not turn to the right or the left;Remove your foot from evil.